Long past are the days when the American farmer relied solely on experience, the advice of friends and the latest Almanac to make decisions about how to produce the biggest yield. The Digital Age has arrived, and farmers are more in the know now than at any other time in the history of agriculture. Given the history of agriculture, that is really saying something. Many anthropologists attribute the very growth of humanity as it is seen today to advances in agriculture. Ironically, it is this very growth that is now putting a strain on agriculture, and making it necessary for farmers to produce food even more efficiently and with better use of vital natural resources. Doing that means farmers must be informed about agricultural best practices, new methods, news, technology, laws and regulations – and particularly water conservation. Below are five recommended water conservation websites for farmers. California often acts as an incubator for new farming technologies and methods due to its more progressive legal system and enormous agribusiness economy. As such, it also frequently serves as a bellwether for processes that are adopted later by other states. This makes the UC Center for Water Resources an exceptional resource for farmers in any locations despite differences in hydrology, soil and other factors. It’s a website that provides comprehensive information on the latest developments in water sustainability and policy. The Soil and Water Management section of the United States Department of Agriculture (USDA) National Agricultural Library is an essential resource for farmers who want to increase their yields with efficient water use while remaining in federal compliance. 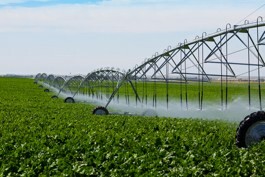 Two sections in particular – Water Conservation and Water-saving Irrigation Techniques – will be useful for large commercial farmers who consume significant quantities of water. That said, an operation of any size could benefit from the many resources that are contained in this library. The unique thing about the National Water Program (NWP) website is that it breaks down water management into eight regions on a clickable map, and when clicked the user is taken to a list of resources suited specifically to that area and reflecting the vast differences in regional water data. The NWP has a larger focus than just agricultural water management, but it does not weaken the information because researchers can see how water conservation in farming relates to all other water use, which is important to know when making decisions about how to save water. This is a rare instance wherein someone can actually benefit by getting to know a little more about the IRS. For those who feel that water conservation in agriculture is nothing more than a policy burden and a means to appease environmentalists who have no experience in water management, they may be happy to know farmers can deduct expenses for water conservation. More information can be found in Publication 225, otherwise known as the Farmer’s Tax Guide, but the short story is that expenses incurred for soil and water conservation can be deducted if the plan has been approved by the Natural Resources Conservation Service. The deduction cannot exceed 25% of the gross income from farming, but it is nevertheless a generous deduction. The National Water Management Center (NWMC) is a subdivision of the aforementioned Natural Resources Conservation Service (NRCS), which in turn is a department of the USDA. Acronym confusion aside, the NWMC website is a good place to go for top-level information on federal policy as it pertains to watersheds, irrigation and other critical water conservation issues. Specific areas in which the NWMC specializes are environmental compliance, watershed management and water quality. It also provides free access to numerous publications that can keep farmers up-to-date on trending water conservation topics.